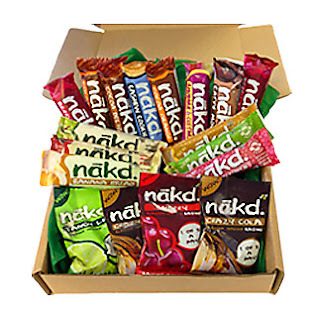 The Vegan Magpie: Let's get Nakd! Hello! I have a feeling the title of this blog is exactly the jokes they were hoping for when they named their company. The box features: 2 x Cola Raisins, Cherry Raisins, Lime Raisins, Apple Pie, Banana Bread, Berry Cheeky, Strawberry Crunch, Apple Crunch, Banana Crunch, 2 x Cocoa Orange, 2 x Berry Delight, Cashew Cookie, Cocoa Delight, Rhubarb and Custard and Caffe Mocha.